The House on Thursday elected Rep. Paul Ryan, R-Wis., to be its next speaker, elevating one of the country’s elected officials who has most consistently targeted federal employees to cut spending. Ryan rose to prominence in part when he put forward budget plans in several consecutive Congresses that aimed to eliminate annual deficits within 10 years. To accomplish that goal, Ryan proposed draconian cuts to federal agencies’ spending levels. Part of those cuts went directly after the federal workforce: Ryan’s blueprints would have slashed the number of federal employees by 10 percent through attrition. Agencies would have been required to replace just one worker for every three that left federal service. He also pitched higher pension contribution levels, suggesting feds contribute 6.35 percent of their paychecks toward their defined benefit. Ryan proposed continuing a federal pay freeze for three additional years, after it had already been in place for two. The now speaker and former House Budget Committee chairman’s plan would have eliminated the Federal Employees Retirement System annuity supplement, which benefits those government workers who retire before the age of 62 and who are not eligible for Social Security. President Obama has also voiced support for doing away with the FERS annuity supplement. Ryan’s plan would have eliminated the student loan repayment benefit for federal workers as well. In 2014, federal agencies doled out $58.7 million in student loan repayment benefits to more than 8,000 federal employees. The extent to which these philosophies will translate to real reforms — his budgets were never adopted into law — remains to be seen. 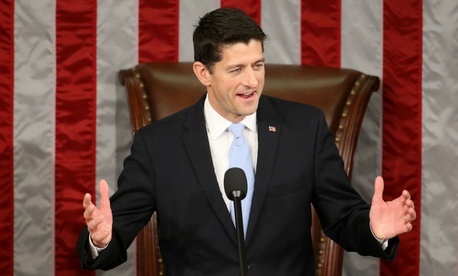 When accepting the speakership on Thursday, Ryan promised to empower committee leaders and rank-and-file members to take the lead in crafting legislation, rather than pursuing a top-down approach. For now, federal employee groups, which have been fiercely critical of Ryan’s proposals in the past, are welcoming the change in House leadership. Other Ryan detractors warned his promotion could be a sign of bad things to come for federal employees.